Our memories of the 2008 U.S. financial crisis primarily concern losses: Bear Stearns, Lehman Brothers, homebuyers, insurers that made reckless bets, and American taxpayers who shouldered billions of dollars in bank bailouts. What about the big wins? One stands out. BlackRock Inc., the world’s largest money manager, may never have grown as far and as fast as it did without the unprecedented changes brought about by the recession. The business now towers over its competitors; its $6.3 trillion in assets under management exceeds the size of Germany’s economy. The story of how BlackRock reached its current position is also the story of the financial industry over the past 10 years. The rise of exchange-traded and index funds and low-fee investing; lower risk tolerance on consumers’ part and higher anxiety within institutions; the government’s scramble to understand this crash and prevent future ones—all of these played to BlackRock’s benefit. The tale of that evolution post-crisis begins with Barclays Plc, which was looking to boost its capital reserves after rejecting U.K. government bailout money. The bank put up one of its crown jewels for sale: the iShares ETF unit, part of the fast-growing, San Francisco-based fund management subsidiary Barclays Global Investors Ltd. (BGI). BlackRock was no stranger to transforming itself through deals, including previous acquisitions of Merrill Lynch Investment Managers and State Street Research & Management Co. When iShares came up for sale, BlackRock was able to seize the opportunity in a big way, sweeping in with a $13.5 billion cash and stock offer—not just for the ETF unit, but for all of BGI. “They were in a position to play offense while everyone else was scrambling,” says Kyle Sanders, an analyst at Edward Jones & Co. The 2009 deal more than doubled BlackRock’s assets under management and has proved hugely valuable since: Riding a wave of investment in passive products, iShares had $1.8 trillion in assets as of the end of June. That gives BlackRock a commanding lead on its closest competitors, Vanguard Group and State Street Corp., which had about $936 billion and $639 billion in ETF assets, respectively. IShares accounted for 28 percent of BlackRock’s assets under management at the end of 2017, according to the company’s yearend report. Plenty of growth potential remains: ETFs are still nascent outside the U.S. The company predicts the global market for the funds will more than double by the end of 2023, to $12 trillion, driven by continued downward pressure on financial advisory fees and investors’ rising willingness to use bond ETFs for easy exposure to fixed-income markets. At the same time, as the U.S. financial system was struggling to get back on its feet, BlackRock found new opportunities to sell its financial risk software, known as Aladdin. Called an “X-ray machine” for financial portfolios by BlackRock Chief Operating Officer Rob Goldstein, Aladdin can predict what a variety of worst-case scenarios would do to a portfolio, including how a 2008-style crash would affect a client’s holdings today. Its users include pension funds, insurance companies, and competing asset managers who pay to license Aladdin based on which of its capabilities they use. By 2010, the software already was a vital growth area for BlackRock. “We’re having more conversations with more institutions as they reassess what they need under this new regulatory environment,” Fink said during an earnings call that year. In the throes of the recession, Aladdin was used on about $7 trillion of positions, according to a report released by the company. Today it watches over more than $18 trillion. Thirty percent of Aladdin business revenue comes from outside the U.S. BlackRock’s technology unit, of which Aladdin has become the linchpin, saw about 12 percent compound annual growth over the past five years, driven in no small part by network effects—few rivals can match its reach. Technology remains just 5 percent of overall revenue, but Fink told Bloomberg Markets last year that he’d like to see it grow to 30 percent by 2022. The most significant development in BlackRock’s business, however, may have been the one least likely to show up in its balance sheet: The crisis gave it new clout and gravitas. Fink understood the complicated derivatives that tanked the financial system better than most; his early career was spent structuring and trading mortgage-backed securities, the same kinds of products that triggered the collapse. When the New York Federal Reserve needed a firm to manage Bear Stearns’s portfolio of toxic assets, it turned to BlackRock—not just because of Fink’s stature, but also because it lacked the conflicts of interest a bank could have had in accepting the job. Timothy Geithner, who was president of the Federal Reserve Bank of New York before becoming U.S. Treasury secretary in 2009, maintained close contact with Fink. In one 18-month period from 2011 to 2012, he was in contact with Fink more than any other corporate executive, according to a Financial Times analysis of his publicly available diary. 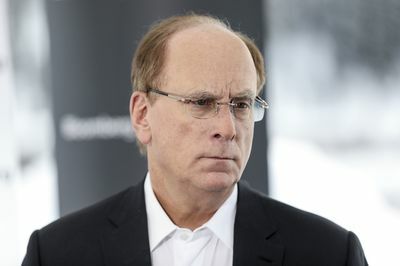 Fink’s influence didn’t hurt when BlackRock and other asset managers worked to convince the Financial Stability Board, a global regulatory body whose members include the Federal Reserve, that their business shouldn’t be deemed “too big to fail.” The designation comes with higher capital requirements and recurring stress tests. Because they manage other people’s assets, the argument went, they don’t take the kind of high-stakes bets with house money that led banks to seek bailouts. BlackRock’s elevated profile on Wall Street remains evident. When Fink wrote CEOs a letter earlier this year warning that they should be able to explain how their companies contribute to society, it made international headlines. He routinely meets with world leaders, including in July, when he participated in a dinner U.K. Prime Minister Theresa May hosted for President Donald Trump. Yet BlackRock hasn’t entirely avoided scrutiny—its cozy relationship with Washington officials has been a source of more attention. The Campaign for Accountability, a Washington, D.C.-based organization, launched a project in June tracking the revolving door of BlackRock executives in and out of halls of power; these include Brian Deese, a climate adviser to the Obama administration who joined BlackRock to run sustainable investing in 2017, and Carol Lee, who went from BlackRock’s compliance department to be securities compliance examiner at the U.S. Securities and Exchange Commission last year. “At BlackRock, understanding local market, policy, regulatory, business, and investment dynamics is integral to serving our clients,” says Beades. 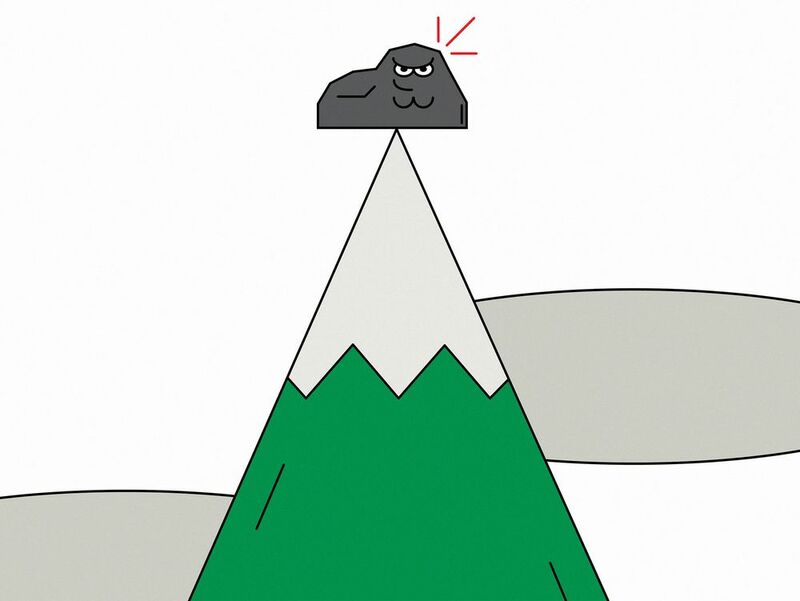 BlackRock’s post-crisis success might be easy to overlook, especially as it’s competing with government-reconstituted giants including JPMorgan Chase & Co. On top of that, private equity firms have vastly increased the scope of their investments in the last decade—particularly Blackstone Group LP, the firm BlackRock spun out of—and tech companies such as Google and Amazon.com Inc. have begun flirting with asset management. Despite the fierce competition, BlackRock’s growth is among the starkest examples of how a financial company can build itself into an empire, even as the system is upended. With the Trump administration’s continued rolling back of protections put in place after the 2008 recession, that skill may yet prove its value again. BOTTOM LINE - Calculated caution left BlackRock in a position to grow when other institutions were squeezed. Influence may yet prove to be its most valuable asset. How the forces Obama and Geithner failed to contain reshaped the world we live in. Laid-off employees exit Lehman Brothers’ office carrying their belongings on Sept. 14, 2008, in New York. It was late January 2010, and Treasury Secretary Timothy Geithner sat slumped in a leather chair as the afternoon sun cast shadows across his ornate corner office. He’d just gotten off the phone with Federal Reserve Chairman Ben Bernanke. The economy was, if not exactly healthy, light-years ahead of where it had been when he took the job a year earlier—a moment when the world teetered on the brink of another Great Depression. The financial contagion had been halted. Growth had returned. The stock market was 10 months into a bull run that continues to this day. But Geithner had the weary resignation of a beaten man. I’d been following him for months for a long magazine profile, and this was our valedictory interview, his chance to pull back and make his best case that the Obama administration had rescued the country from financial ruin. Geithner had every confidence they’d made the right choice by focusing single-mindedly on restoring growth rather than indulging what he derisively called the public’s clamor for “Old Testament justice.” But his sales pitch kept dissolving into fatalism. Geithner’s cynicism was prescient—yet he still didn’t grasp the full scale of the public’s wrath or how long it would endure. He and Obama saw the crisis primarily as a macroeconomic event that could be solved through a series of aggressive technical fixes. As they arranged the mergers, bailouts, and Fed lifelines that rescued corporations from Citigroup to General Motors to Goldman Sachs, they prided themselves on their ability to tune out the public’s justified anger at the greed and recklessness exhibited by financiers and mortgage lenders. This extended even to some clear-cut abuses of the public trust that occurred on their watch, such as when American International Group Inc.—by then a ward of the state—decided to hand out bonuses. What was so surreal about this period was not Obama’s conviction that growth was a magical elixir that would set everything right. It was his belief that achieving it required him to protect, rather than punish, those who’d driven the economy into the ground. Summoning the chief executive officers of the major banks to the White House in the spring of 2009, Obama told them, “My administration is the only thing between you and the pitchforks.” Like flagellants, he and his economic team were willing to absorb the lashing that should rightfully have been directed at his Wall Street guests, in the belief that shielding them advanced a higher purpose. Ten years after the crisis, it’s clear Obama was foolish to think public sentiment could be negated or held at bay. Financial crises are every bit as much about politics as economics. How could they not be? Millions of people lost their job, their home, their retirement account—or all three—and fell out of the middle class. Many more live with a gnawing anxiety that they still could. Wages were stagnant when the crisis hit and have remained so throughout the recovery. Recently the Bureau of Labor Statistics reported that U.S. workers’ share of nonfarm income has fallen close to a post-World War II low. But personal material conditions alone didn’t drive the public response to the crisis. There was a moral component as well. A bitter irony dawning on Geithner at the time of our meeting was that a substantial number of Americans saw the rising stock market not as a gauge of economic revitalization but as an infuriating reminder that the financial overclass responsible for the crisis not only got off scot-free but was also getting richer in the bargain. The iniquity stung. One complaint voters at campaign rallies still share with me is that no Wall Street figure of any consequence served jail time as a result of the meltdown. By contrast, the U.S. Department of Justice prosecuted more than 1,000 bankers after the savings and loan crisis of the 1990s. 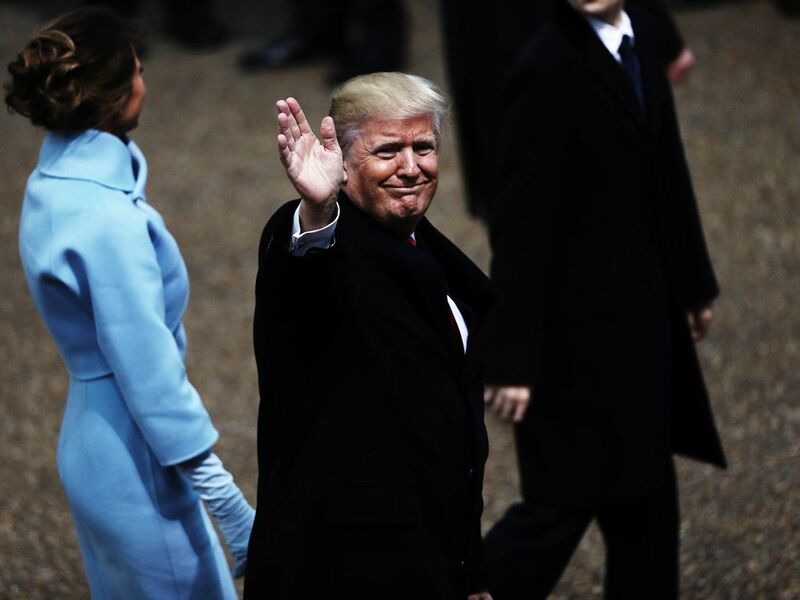 Donald and Melania Trump walk in the inaugural parade on Jan. 20, 2017, in Washington. In a democracy, the pitchfork-wielding masses will eventually make themselves heard. The story of American politics over the past decade is the story of how the forces Obama and Geithner failed to contain reshaped the world. The day-to-day drama of bank failures and bailouts eventually faded from the headlines. But the effects of the disruption never went away, unleashing partisan energies on the Left (Occupy Wall Street) and the Right (the Tea Party) that wiped out the political era that came before and ushered in a poisonous, polarizing one. The critical massing of conditions that led to Donald Trump had their genesis in the backlash. 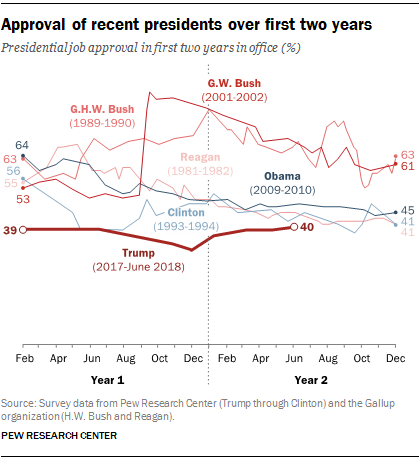 And the rising tide of economic populism among Democrats makes it all but certain that the next presidential election, and Trump’s possible successor, will be shaped by it, too. The biggest effect of the financial crisis and its aftermath was a loss of faith in U.S. institutions. Initially, and not surprisingly, this loss of confidence was concentrated in the financial sector. When Obama was first elected president during the depths of the crisis, Gallup reported that confidence in banks had fallen to an historic low. An overwhelming number of Americans (86 percent) cited economic issues as the country’s most pressing problem. But as time went on, the blame spread. Antipathy toward Wall Street eventually became distrust of the government, which not only struggled to mitigate the effects of the meltdown but also began producing its own crises, including a debt default scare in 2011 and a shutdown two years later. In 2013, five years into the recovery, Gallup discovered that Americans no longer considered “economic issues” to be the most pressing national problem: “Government” had replaced them as the top concern. That shift in blame didn’t happen by accident. The other reason the financial crisis became such a powerful shaping force in our politics is that Republicans (and later Democrats such as Bernie Sanders) weaponized it for their own ends. The architect of this strategy was Senate Majority Leader Mitch McConnell. During the final months of George W. Bush’s presidency, when Lehman Brothers went under and the global economy looked poised to follow, the Kentucky senator helped push through the Troubled Asset Relief Program (aka “the bailout”), a bipartisan bill Bush signed into law a month before the 2008 election. At the time, McConnell lauded TARP’s passage as “one of the finest moments in the history of the Senate,” a comment that earned him the enmity of conservative hard-liners forever after. But anger in politics is a lot like a forest fire—it can quickly burn out of control. By the time Trump declared his candidacy in 2015, Americans of every persuasion had soured on the “elites” running both parties, something his Republican opponents didn’t understand until far too late. Today, his campaign is remembered as having been driven mostly by anti-immigrant animosity. But at Steve Bannon’s insistence, Trump spent loads of time attacking Wall Street on behalf of the forgotten little guy and fanning the suspicion that a cabal of political and financial eminences was screwing ordinary people. His closing message in the campaign consciously evoked the disgust so many people had come to feel toward Wall Street and Washington. His final ad on the eve of the election flashed images of Federal Reserve Chair Janet Yellen and Goldman Sachs CEO Lloyd Blankfein and sought to implicate them, and Hillary Clinton, in what Trump called “a global power structure that is responsible for the economic decisions that have robbed our working class, stripped our country of its wealth, and put that money into the pockets of a handful of large corporations and political entities.” He added, “The only thing that can stop this corrupt machine is you.” It’s no surprise this message struck a chord: What is Trump if not the embodiment of a balled fist and a vow to deliver Old Testament justice? 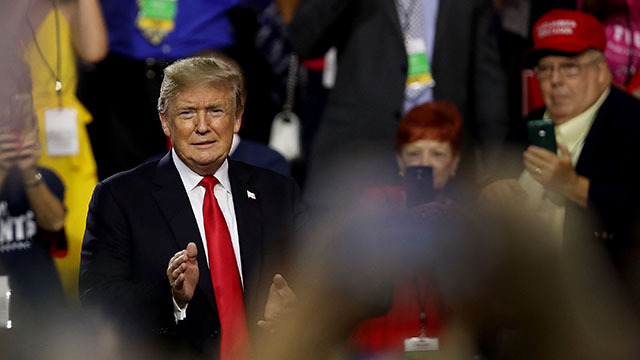 Democrats have responded to Trump with a kind of cathartic disinhibition, throwing off the shackles Obama had imposed by holding bankers harmless and agreeing to cut entitlement programs to balance the budget. Lately, the energy on the Left has been around big, budget-busting ideas such as free college tuition and Medicare for all that are themselves a response to the crisis—a ratcheting up of demands on the government by those unhappy with the narrowness of the recovery. Lurking among these proposals is a long-thwarted desire to square accounts with the Wall Street-Washington establishment that has steered the political economy since the crisis. This is most evident in Elizabeth Warren’s new bill, the Accountable Capitalism Act, which would greatly empower workers at the expense of their corporate bosses while redistributing wealth from the 1 Percent downward (the moral element is right there in the title). Among the political and financial cognoscenti, these proposals are mostly considered outlandish and have been met with a combination of eye-rolling and derision. They should probably be taken more seriously, since they’re another expression of frustration with a system that hasn’t produced a satisfying recovery for tens of millions of Americans. Predicting how this energy will further shape our politics is all but impossible. When Geithner and I sat in his office back in 2010 contemplating what might lie ahead, neither of us could have fathomed (nor could anyone else) that one consequence of the financial wreckage would be President Donald Trump. The lesson that stands out all these years later is the same one Geithner was just coming to appreciate: Ignoring popular sentiment always has political consequences, and they’re often ones we can’t possibly imagine. 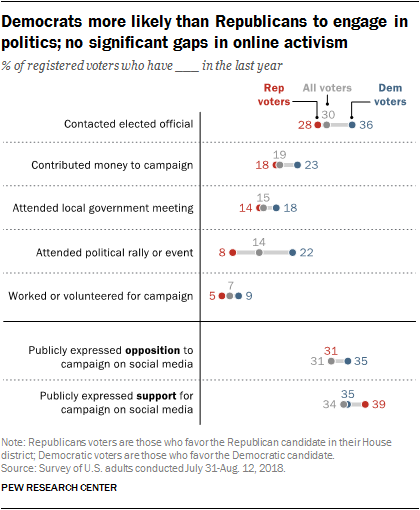 The new national survey by Pew Research Center, conducted July 31-August 12 among 4,581 adults, including 4,000 registered voters, finds that 14% of voters say they have attended a political rally, protest or campaign event in the past year. To address understandable American anger, China must admit it’s a superpower -- and start playing by global rules. 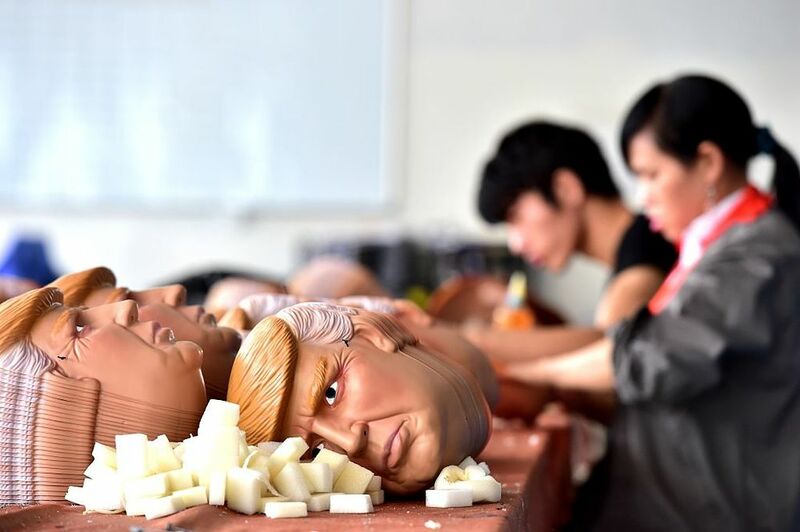 Trump captured Americans’ resentment about China’s rise. It was late November 2016, and my Chinese counterpart, Vice Premier Wang Yang, was visiting Washington, D.C. Over the course of my tenure as U.S. Secretary of Commerce, the vice premier and I had developed a warm and candid relationship. Since this was to be our last official meeting, I decided to do something a bit different: take him to rural Virginia for a traditional Thanksgiving meal. While we were surrounded by our usual phalanx of security, we effectively sat alone, with the exception of our two closest aides. Shortly after we were seated, the vice premier leaned in close and almost whispered to me, “Can you explain what just happened in your presidential election?” Clearly, the Chinese were just as surprised by the results as we were. I told the vice premier that we were still trying to understand the outcome ourselves, but that it was important for him to appreciate that China had played a significant role in the election. As the translator spoke into his ear, he shot me a somewhat surprised look. I explained that then-candidate Donald Trump’s “tough on China” rhetoric had tapped into an underlying strain of thought in the U.S. that Wang and other Chinese leaders needed to understand. For years, Americans were told that China was a developing country and shouldn’t necessarily be held to the same standard as developed nations such as the U.S. But China’s success had severely undercut that line of reasoning. The Chinese economy was growing at 6 percent or more annually. Chinese cities, roads, ports and bridges were rising seemingly overnight. The world’s low-cost manufacturer was rapidly becoming a global technology hub. And the Chinese government was investing billions of renminbi in support of its “Made in China 2025” industrial plan. The disconnect between rhetoric and reality was profound and growing by the day. At the same time, Americans felt that at least some of China’s success had come at their expense. They were seeing their middle-class jobs and once-prosperous lifestyles disappearing. China wasn’t playing fairly; it was consistently violating its international commitments and tilting the playing field to advantage Chinese firms. Economic complexities aside, the fact that Americans were, in part, paying the bill for such behavior had begun to sink in with millions of my fellow citizens. Candidate Trump, of course, didn’t create these imbalances; he was simply very effective at tapping into this growing resentment. With or without Trump, the U.S.-China relationship was moving quickly toward a crossroads. The point I was making to the vice premier is that, as China has risen to become a global power, the dynamic between the two countries has unquestionably changed. Meanwhile, too many Chinese actions and policies have not. In fact, Chinese officials still frequently rely on the outdated rhetoric that China is merely a developing country. The developing nation narrative is clearly at odds with the observable reality of modern China, and it logically runs counter to China’s lofty goal of establishing a “new model of great power relations” between the U.S. and China — a dynamic focused on fostering cooperation and competition but avoiding confrontation, which, historically, has been the defining feature of relations between existing and rising powers. It is hard to be both a poor, developing nation and the other party to a “new model of great power relations.” The formulation assumes the existence of two great powers. In the modern world, though, being a great power requires leadership. It requires being a good steward of the global economy, not just benefiting from it. It requires playing by the same rules and competing fairly, not relying on state resources to support domestic industries and innovation. If China wants to be the world’s other great power, it is manifestly in its interest to start acting like one. To be fair, we have seen China emerge as a global leader on certain issues — such as climate — and, in recent months, President Xi Jinping has spoken consistently about China assuming a larger role in world affairs. In other areas, however, particularly those tied to economic and trade policy, the rhetoric continues to surpass the policies. In part, it was this disconnect between words and reality that gave Trump his political resonance in the U.S. China is a great power. China has risen and, in so doing, has lifted 800 million people out of poverty. But, if China doesn’t change its approach to economic competition, I fear that today’s trade war will be nothing compared to the heightened tensions to come. Frankly, our domestic political system will demand action and President Trump will look like the mild first incarnation of a trend rather than an outlier. The U.S. hosted roughly 130,000 Chinese graduate students during the 2016-2017 academic year. On average, each of those Chinese students spends more than $26,000 per year in the U.S.
Chinese direct investment in the U.S. expanded dramatically to $46 billion in 2016, before a steep decline in 2017. That investment has hyper-charged a range of sectors in all corners of our country. In less than 10 years, spending from Chinese tourists in the U.S. has more than quadrupled to over $20 billion annually. Xi and then-President Barack Obama agreed to offer new 10-year tourist visas to citizens of both countries, so we can expect that number to grow. In large part, China’s progress wouldn’t have been possible without the stable global economic order that the U.S. has underwritten and secured for the last 70 years. In that time, this system has limited conflict and led to the greatest increase in prosperity the world has ever seen. Without question, particularly over the last two decades, China has reaped the benefits of this rules-based order not just by competing aggressively but, it must be said, at times exploiting the existing system. That must change. If it doesn’t, I fear that the stated goal of this “new model of great power relations” — competitive cooperation — will fall victim to China’s inability to change course. Then the politically plausible options for navigating China’s rise over the decades to come will be narrowed down to one: confrontation. 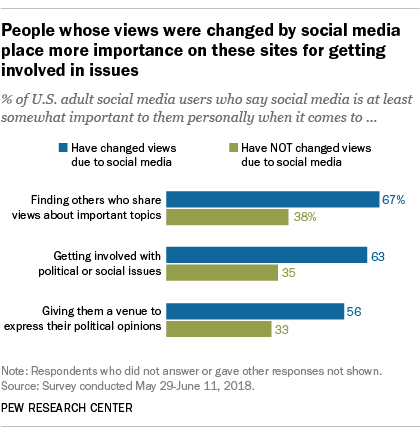 One of the biggest challenges facing those who seek to understand U.S. elections is establishing an accurate portrait of the American electorate and the choices made by different kinds of voters. Obtaining accurate data on how people voted is difficult for a number of reasons. Surveys conducted before an election can overstate – or understate – the likelihood of some voters to vote. Depending on when a survey is conducted, voters might change their preferences before Election Day. 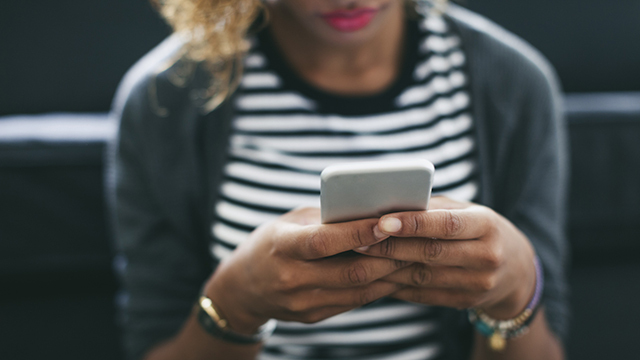 Surveys conducted after an election can be affected by errors stemming from respondents’ recall, either for whom they voted for or whether they voted at all. Even the special surveys conducted by major news organizations on Election Day – the “exit polls” – face challenges from refusals to participate and from the fact that a sizable minority of voters actually vote prior to Election Day and must be interviewed using conventional surveys beforehand. This report introduces a new approach for looking at the electorate in the 2016 general election: matching members of Pew Research Center’s nationally representative American Trends Panel to voter files to create a dataset of verified voters. The analysis in this report uses post-election survey reports of 2016 vote preferences (conducted Nov. 29-Dec. 12, 2016) among those who were identified as having voted using official voting records. These voter file records become available in the months after the election. 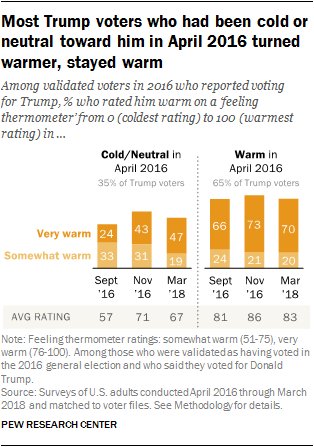 (For more details, see “Methodology.”) Among these verified voters, the overall vote preference mirrors the election results very closely: 48% reported voting for Hillary Clinton and 45% for Donald Trump; by comparison, the official national vote tally was 48% for Clinton, 46% for Trump. This data source allows researchers to take a detailed look at the voting preferences of Americans across a range of demographic traits and characteristics. It joins resources already available – including the National Election Pool exit polls, the American National Election Studies and the Current Population Survey’s Voting and Registration Supplement – in hopes of helping researchers continue to refine their understanding of the 2016 election and electorate, and address complex questions such as the role of race and education in 2016 candidate preferences. It reaffirms many of the key findings about how different groups voted – and the composition of the electorate – that emerged from post-election analyses based on other surveys. Consistent with other analyses and past elections, race was strongly correlated with voting preference in 2016. But there are some differences as well. 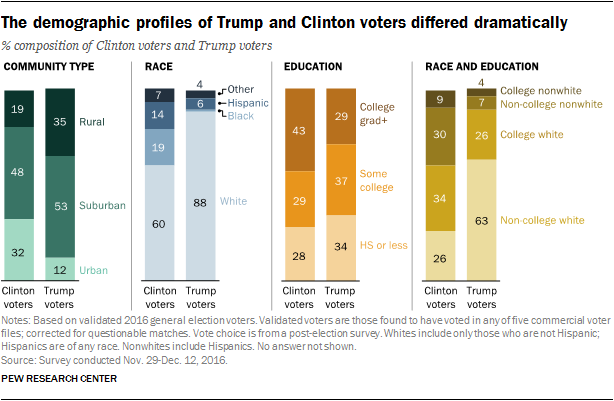 For instance, the wide educational divisions among white voters seen in other surveys are even more striking in these data. Overall, whites with a four-year college degree or more education made up 30% of all validated voters. Among these voters, far more (55%) said they voted for Clinton than for Trump (38%). Among the much larger group of white voters who had not completed college (44% of all voters), Trump won by more than two-to-one (64% to 28%). Voter choice and party affiliation were nearly synonymous. Republican validated voters reported choosing Trump by a margin of 92% to 4%, while Democrats supported Clinton by 94% to 5%. The roughly one-third (34%) of the electorate who identified as independent or with another party divided their votes about evenly (43% Trump, 42% Clinton). 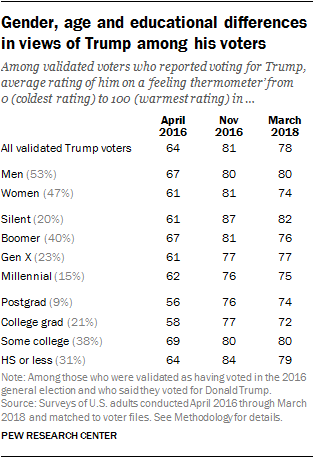 Virtually all validated voters with consistently liberal values voted for Clinton over Trump (95% to 2%), while nearly all those with consistently conservative values went for Trump (98% to less than 1% for Clinton). 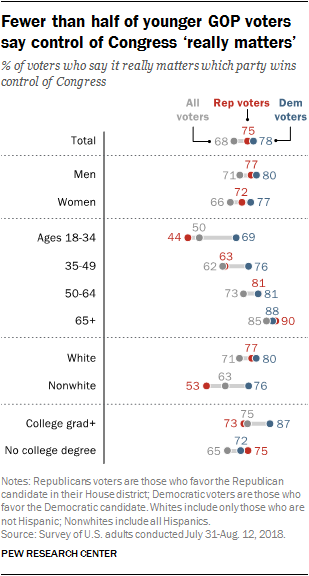 Those who held conservative views on most political values (“mostly conservative”) favored Trump by 87% to 7%, while Clinton received the support of somewhat fewer among those who were “mostly liberal” (78%-13%). Among the nearly one-third of voters whose ideological profile was mixed, the vote was divided (48% Trump, 42% Clinton). As in previous elections, voters in 2016 were sharply divided along religious lines. Protestants constituted about half of the electorate and reported voting for Trump over Clinton by a 56% to 39% margin. Catholics were more evenly divided; 52% reported voting for Trump, while 44% said they backed Clinton. Conversely, a solid majority of the religiously unaffiliated – atheists, agnostics and those who said their religion was “nothing in particular” – said they voted for Clinton (65%) over Trump (24%). Within the Protestant tradition, voters were divided by race and evangelicalism. White evangelical Protestants, who constituted one out of every five voters, consistently have been among the strongest supporters of Republican candidates and supported Trump by a 77% to 16% margin. This is nearly identical to the 78% to 16% advantage that Mitt Romney held over Barack Obama among white evangelicals in Pew Research Center polling on the eve of the 2012 presidential election. Among white mainline Protestants (15% of voters overall) 52% said they voted for Trump and 44% reported voting for Clinton. This, too, was very similar to the mainline Protestant split in 2012. Clinton won overwhelmingly among black Protestants (96% vs. 3% for Trump). White non-Hispanic Catholics supported Trump by a ratio of about two-to-one (64% to 31%), while Hispanic Catholics favored Clinton by an even larger 78% to 19% margin. 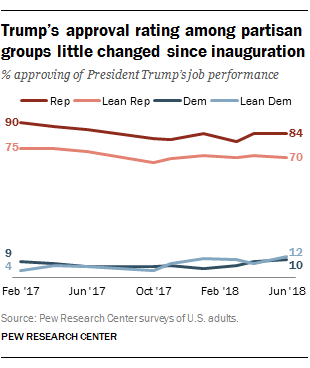 Among all voters, those who reported attending services at least weekly favored Trump by a margin of 58% to 36%; the margin was similar among those who said they attended once or twice a month (60% to 38%). Those who reported attending services a few times a year or seldom were divided; 51% supported Clinton and 42% supported Trump. Among the nearly one-quarter of voters (23%) who said they never attend religious services, Clinton led Trump by 61% to 3o%. As the pattern of the votes implies, the coalitions that supported the two major party nominees were very different demographically. 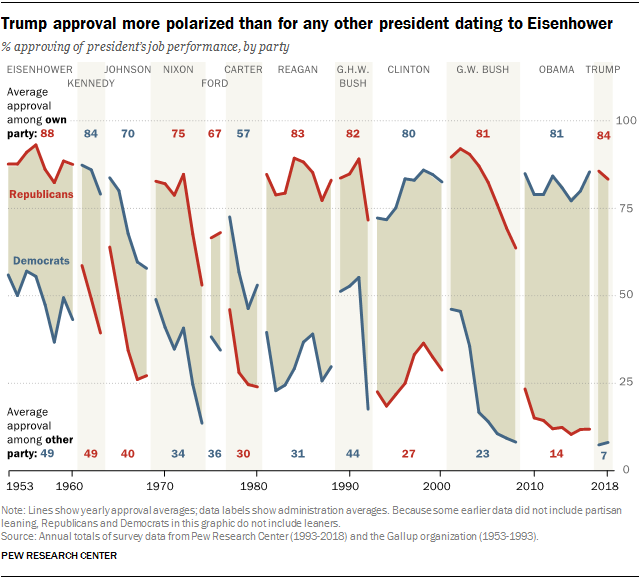 These differences mirror the broad changes in the compositions of the two parties: The Republican and Democratic coalitions are more dissimilar demographically than at any point in the past two decades. In 2016, a 61% majority of those who said they voted for Clinton were women, while Trump voters were more evenly divided between men and women. Whites constituted nearly nine-in-ten (88%) of Trump’s supporters, compared with a smaller majority (60%) who voted for Clinton. Clinton’s voters also were younger than Trump’s on average (48% were younger than 50, compared with 35% for Trump). Among Clinton voters, 43% were college graduates, compared with 29% of Trump voters. And while non-college whites made up a majority of Trump’s voters (63%), they constituted only about a quarter of Clinton’s (26%). About a third of Clinton voters (32%) lived in urban areas, versus just 12% among Trump voters. By contrast, 35% of Trump voters said they were from a rural area; among Clinton voters, 19% lived in a rural community. The religious profile of the two candidates’ voters also differed considerably. About a third of Clinton voters (35%) were religiously unaffiliated, as were just 14% of Trump voters. White evangelical voters made up a much greater share of Trump’s voters (34%) than Clinton’s (7%). One-in-five Trump voters (20%) were white non-Hispanic Catholics, compared with just 9% of Clinton voters. And black Protestants were 14% of Clintons supporters, while almost no black Protestants in the survey reported voting for Trump. How did 2016 voters and nonvoters compare? 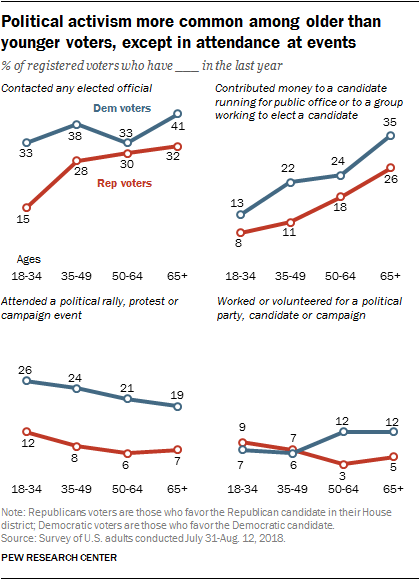 The data also provide a profile of voting-eligible nonvoters. Four-in-ten Americans who were eligible to vote did not do so in 2016. 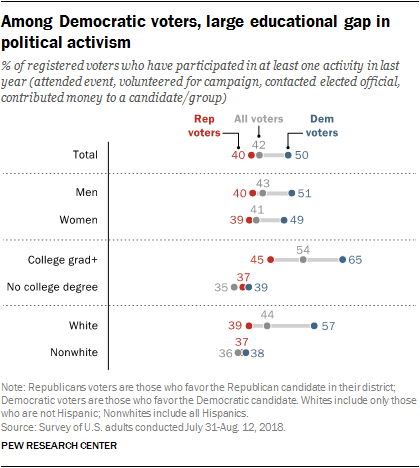 There are striking demographic differences between voters and nonvoters, and significant political differences as well. Compared with validated voters, nonvoters were more likely to be younger, less educated, less affluent and nonwhite. And nonvoters were much more Democratic. Among members of the panel who were categorized as nonvoters, 37% expressed a preference for Hillary Clinton, 30% for Donald Trump and 9% for Gary Johnson or Jill Stein; 14% preferred another candidate or declined to express a preference. Party affiliation among nonvoters skewed even more Democratic than did candidate preferences. 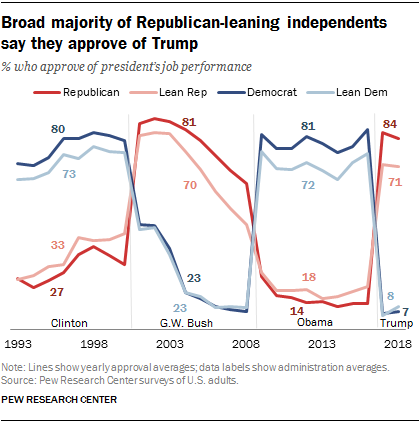 Democrats and Democratic-leaning independents made up a 55% majority of nonvoters; about four-in-ten (41%) nonvoters were Republicans and Republican leaners. Voters were split almost evenly between Democrats and Democratic leaners (51%) and Republicans and Republican leaners (48%). While nonvoters were less likely than voters to align with the GOP, the picture was less clear with respect to ideology. Owing in part to the tendency of nonvoters to be politically disengaged more generally, there are far more nonvoters than voters who fall into the “mixed” category on the ideological consistency scale. 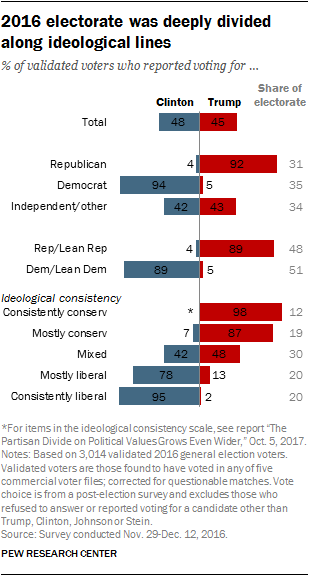 Among nonvoters who hold a set of political values with a distinct ideological orientation, those with generally liberal values (30% of all nonvoters) considerably outnumbered those with generally conservative values (18%). Voters were much more highly educated than nonvoters. 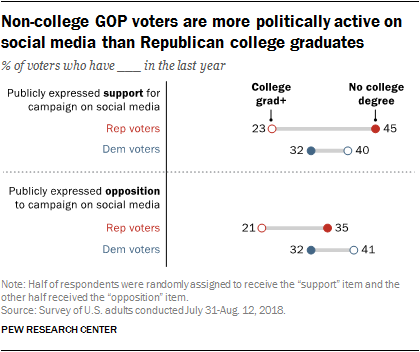 Just 16% of nonvoters were college graduates, compared with 37% of voters. Adults with only a high school education constituted half (51%) of nonvoters, compared with 30% among voters. Whites without a college degree made up 43% of nonvoters, about the same as among voters (44%). 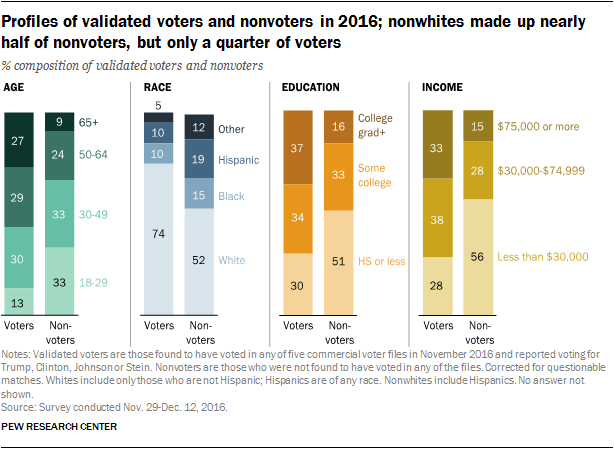 But nonwhites without a college degree were far more numerous among nonvoters (at 42%) than they were among voters (19%). There also were wide income differences between voters and nonvoters. More than half (56%) of nonvoters reported annual family incomes under $30,000. Among voters, just 28% fell into this income category. New York Gov. 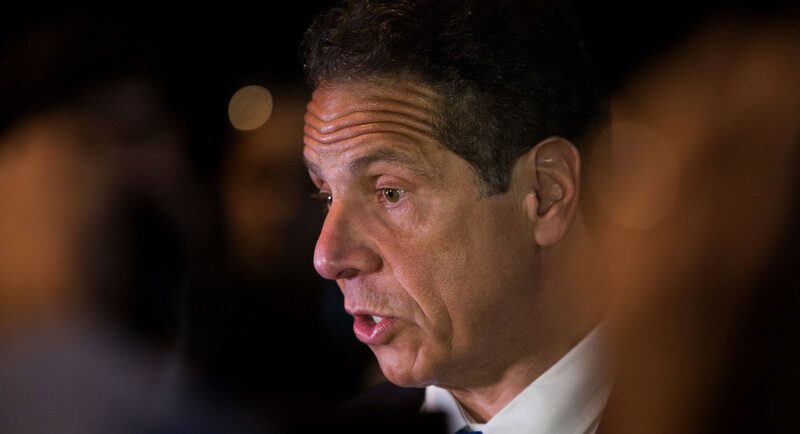 Andrew Cuomo, who is running a tense reelection campaign, is facing backlash after putting a twist on Trump's 2016 campaign slogan. 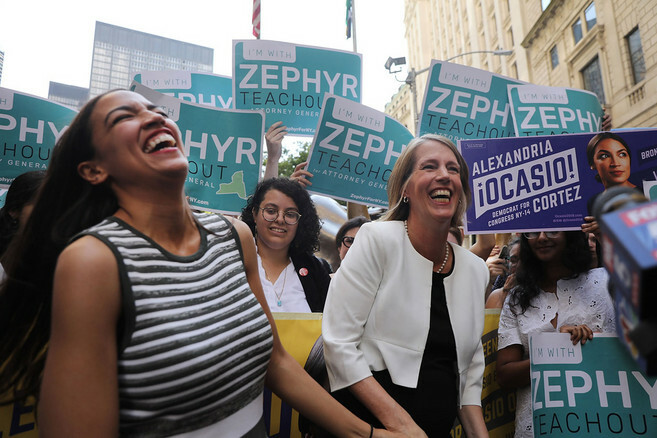 Progressive favorite Zephyr Teachout promises to retool the powerful New York prosecutor’s office to go straight after Donald Trump. She’s not the only one. Is this the road Democrats want to go down? Zephyr Teachout, the would-be next attorney general of New York, sits tight against the desk in the former doctor’s office she’s using for her campaign headquarters, her very pregnant belly barely visible above the desk’s metal top. She runs her hands through her hair like a law professor lecturing on a particularly thorny constitutional question. She lays out precisely how she could, if elected, use her office put Donald Trump in prison. Teachout is a 46-year-old professor of law at Fordham University, where she teaches classes on antitrust and the Constitution. As a young lawyer from Vermont, Teachout joined the Howard Dean campaign as director of internet organizing; a magazine story from the time described her as “a slight, freckled lawyer” who “darts around the office in a pair of silver shoes with the balletic, boyish energy of Peter Pan.” The shoes are gone now, but the energy is unchanged, even with Teachout due to give birth to her first child in October. The New York AG’s office is known for the firepower of its prosecutors and the ambition of its occupants. Robert Abrams saw himself as taking the place of federal regulators defanged in the Reagan era; Eliot Spitzer unearthed an obscure 70-year-old law to go after the financial wrongdoing of Wall Street billionaires. Eric Schneiderman compelled the president to fork over $25 million to settle Trump University fraud lawsuit. Teachout is another type of force entirely, a professor with expertise on both corruption and the Constitution, whose skills seem uniquely tailored to this strange moment in American politics. She may never occupy the office—she’s tied for second in a four-person race, with close to half of likely voters undecided—but her anti-Trump battle plan has already shaped the contours of the race, with other occupants competing to out-anti-Trump one another, virtually guaranteeing the office will have a strong focus on the president. Nationally, it represents maybe the most extreme example of a specific new theory of Democratic politics: that the President of the United States represents a red-level threat alert to the republic, and that the first job of Democratic politicians, and especially Democratic prosecutors, is to stop him. “We need someone in the AG’s office who is going to dig under every rock,” she says, promising “new tools” and “cutting-edge theories” about how a state-level prosecutor can go after the business, charity and personal empire of a sitting president. Teachout first drew political attention for her long-shot primary campaign against Governor Andrew Cuomo in 2014, in which she grabbed a surprisingly large share of the vote and pushed Cuomo to govern from the left in his second term. After a failed bid for Congress, her political career seemed done until New York Attorney General Eric Schneiderman was forced to resign in a sexual harassment scandal in May, and she quickly declared that she was in the race to succeed him. 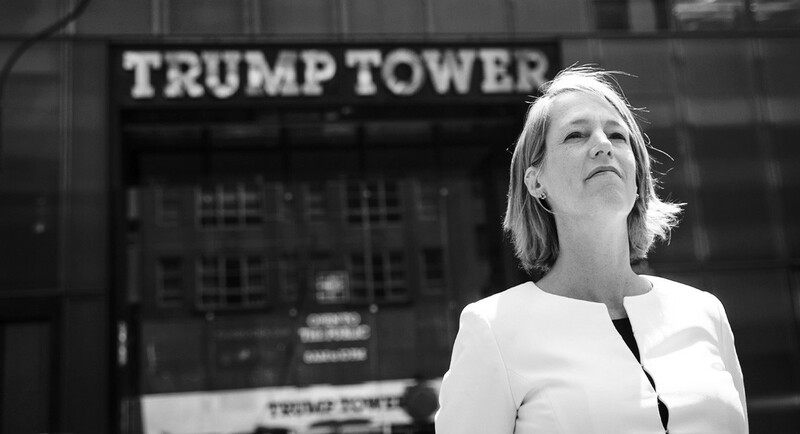 Zephyr Teachout points to Trump Tower during a campaign stop on June 5, 2018, in New York. She’s made the traditional promises of an AG, of course, saying she’ll police Wall Street and clean up Albany; she’s pledged to curb the influence of the real-estate industry. But the meat of her campaign is a very specific message: If elected, she wants to refocus the attorney general’s office on investigating Trump, his family, his associates and his businesses for possible money laundering, bank fraud and larceny. She wants the office to start preparing itself on Day One for the possibility that Trump could fire Robert Mueller or otherwise try to gut the special counsel’s investigation. If Trump pardons members of his family or his associates, Teachout says, the office needs to be ready for that, too—prepared to bring charges under state law when applicable. This has turned Teachout into something of a star of #TheResistance, and would-be attorneys general around the country are paying heed. In Minnesota, Democratic nominee for AG Keith Ellison launched his campaign telling ABC News that he wanted to be the “legal resistance” to the Trump administration at the state level, even as he conceded that it would be a “mistake” to dwell too much on Trump; In Florida, Democratic front-runner Sean Shaw has pledged to catch the Sunshine State up with anti-Trump lawsuits other states have filed. Can Democrats both be the party of preserving civic norms and the party of “Lock Him Up”? The critique gets to the heart of what it means to be a Democrat in the Age of Trump, or a principled officeholder of any party, where the job consists both of moving an agenda forward and also defending the system itself from a leader who flouts the norms that kept it healthy in the first place. Can Democrats both be the party of preserving civic norms and the party of “Lock Him Up”? If it were any almost other candidate, tilting at the White House like this would seem like a pointless exercise. And even Teachout’s AG campaign can seem a little quixotic: She has never held office, and never run a campaign with any real support from her own party establishment. But legal experts take her expertise on the Trump front very, very seriously. She literally wrote the book on political corruption—Corruption in America: From Benjamin Franklin’s Snuff Box to Citizens United, published in 2014—and after Trump won, she was one of the first to recognize what kind of Constitutional problem the president was creating by failing to divest himself from his businesses. Writing in The New York Times less than two weeks after the election, Teachout identified the “emoluments clause”—a heretofore obscure provision of Article 1 of the Constitution—as essentially an anti-bribery rule, one of several constitutional provisions written to prevent foreign powers from influencing domestic affairs. Running an international hotel and golf business essentially guarantees Trump is taking money from foreign powers, potentially giving wealthy individuals and governments leverage over presidential decisions. The emoluments clause, she argues, is a cornerstone of American democracy—one that we’d simply never needed to enforce before, because no president had chosen to retain control of a multinational company while holding office. “She had a laser-like clarity from Day One about what the Constitution means,” said Norm Eisen, a former government ethics official who co-founded the nonpartisan watchdog group Citizens for Responsibility and Ethics in Washington, whose board Teachout joined last year. Along with the attorneys general of Maryland and Washington, D.C., Teachout and CREW helped assemble a long-shot lawsuit against Trump accusing him of violating the emoluments clause by accepting gifts from foreign and state governments through his D.C. hotel, which earned $40 million in revenues in Trump’s first year in office. The suit is still working its way through the courts: Late last month a federal judge rejected Trump’s bid to dismiss the lawsuit, so now lawyers from both AGs’ offices are allowed to review financial records of Trump’s businesses and interview employees of the Trump Organization. She also thinks she can go further than Barbara Underwood, Schneiderman’s successor—though she credits Underwood for suing the Trump Foundation for violations of tax and campaign finance law, triggering a state investigation that could lead to criminal prosecution. “She has done more to take on Donald Trump in the last two months than Eric Schneiderman did in seven years,” Teachout said. If Teachout wins, she already has her game plan. Her first priority in office, she says, is to file an emoluments lawsuit that forces Trump to release his tax returns and his business records, and to divest from his businesses in New York—the cradle of the Trump empire. The second priority is to investigate Trump’s business and foundation under two obscure state laws known as 63(12) and 1101, which could lead to the kind of civil criminal actions that in extreme cases allow the AG to dissolve the corporation. She also says she would seek broad criminal jurisdiction from the governor when necessary to pursue criminal charges in case any illegality is found on the part of Trump or his family. She’s already notched one win. Teachout has been pushing since the start of her campaign for Cuomo to provide the attorney general’s office a criminal referral, necessary if Underwood is going to pursue charges in the foundation case. Last month, the governor did, a move that that has largely been credited to Teachout’s advocacy—but that Teachout says is still too limited. 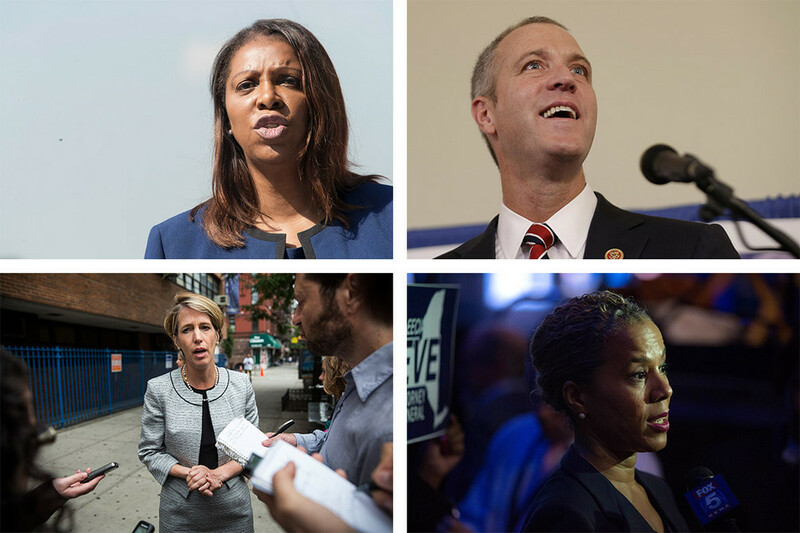 Teachout’s focus on Trump has helped turn what once looked like a long-shot candidacy into a serious threat to front-runner Letitia James, New York City’s public advocate. She is currently tied with Rep. Sean Patrick Maloney for second place, while former Hillary Clinton and Cuomo aide Leecia Eve runs in fourth. But critics look at all this posturing, the promises to go after one man, and wonder what has become of the basic fairness principle that goes with holding American office. Are Teachout and her fellow candidates really promising to spend the powers of their state office taking on a sitting president personally? In an interview, Nyhan elaborated: “It is worrisome when any candidate for a prosecutorial office announce their intention to pursue a prosecution for someone from the other party before they have examined the evidence in that office,” he said. He compared Teachout’s comments to those of James Comey, who made it be known what he thought of Hillary Clinton’s email practices before declining to bring charges. There is a risk, too, for the Democratic Party: That the “lock him up” approach could turn into a litmus test for highly activated anti-Trump voters in the Democratic primary, making life harder for candidates around the country. “We are just happily sitting back watching the food fight on the left,” said Zach Roday, communications director for the Republican Attorneys General Association. All of this has led to Teachout becoming something of a favorite punching bag on the right, too. Fox News has particularly targeted her, especially after Teachout cut a video promising to bring prosecutions against ICE agents who commit criminal acts, with both Tucker Carlson and “Fox & Friends” getting their licks in. On a scorching hot August day in New York, Teachout ventured out to Bushwick to endorse Julia Salazar, a 27-year-old member of the Democratic Socialists of America running for the state Senate against a 15-year incumbent. There was no real press presence to speak of, and no real people either, except for a few volunteers from both campaigns who stood in the background to hold campaign signs for the Facebook Live broadcast. It is part of Teachout’s strategy: even before Alexandria Ocasio-Cortez upended the career of Joe Crowley, the fourth-ranking Democrat in the House and the boss of the Queens Democratic machine, New York was awash in primary challengers to establishment Democrats up and down the ballot. 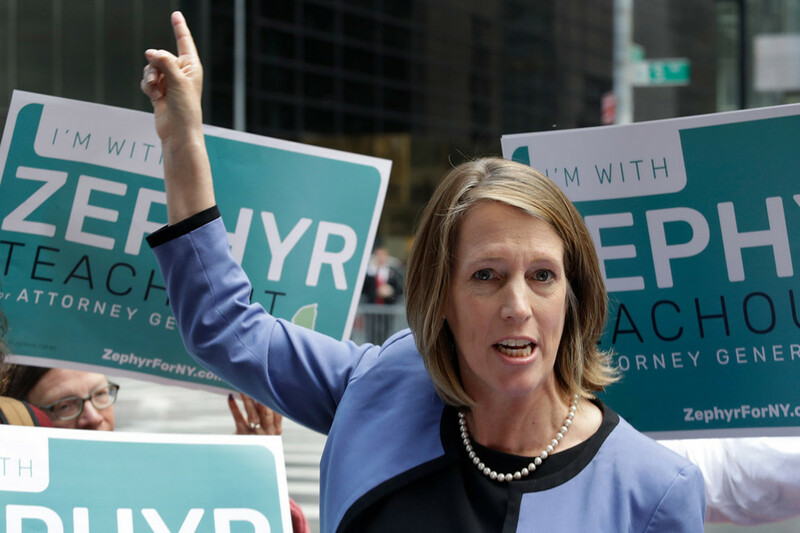 Teachout, who was running against the establishment from the left back when “the resistance” still referred to World War II, supports nearly all of them, including Cynthia Nixon, who is mounting her own long-shot campaign for governor. They see themselves as harnessing the liberal anger at the Democratic establishment that has been bubbling throughout the country; the primary challengers, who are mostly women, and mostly women of color, are now running as a slate in the September primary. She doesn’t see herself as promising that Trump will be led out of the Oval Office in handcuffs; rather, she’s promising to follow the law and arguing that the law is already pointing pretty strongly in one direction. On Day One, as she sees it, New York will join the emoluments lawsuit. To know the scope of the emoluments violation, Trump’s tax returns will be required, as will other financial records. If Trump refuses to comply with the court request, the nation will be in uncharted political territory, and Teachout, the law professor, thinks that the Constitution is clearly on her side.